Cherophobia or “the fear of happiness” is a specific type of phobia and sub type of anxiety disorder characterized by persistent, unwarranted, irrational and intense fear or worry of happiness, bliss, joy, or celebrating. Individuals with cherophobia are known to deliberately avoid situations and experiences that invoke happiness or positive emotions. A cherophobic person may feel guilty about feeling happiness as they think they don’t deserve to be happy and soon after experiencing some positive emotion they will become depressed or they might always try to avoid happiness or other things that can make them happy, because they fear something bad will happen afterwards. At first look cherophobic persons could seem completely normal and live normal lives but most commonly avoid hanging out with friends and or doing fun activities. Cherophobia is pronounced as [care-o-fo-be-uh]. 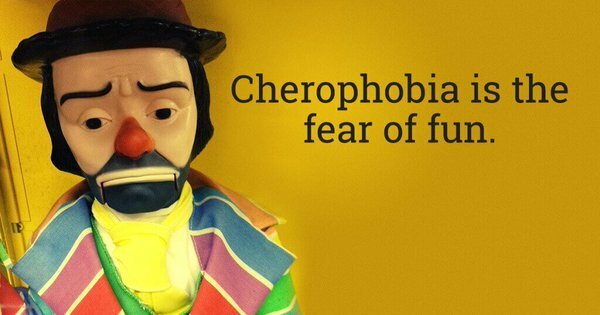 The word cherophobia comes from the Greek words ‘chero’ meaning ‘joy, happiness or gaiety’ and ‘phobia’ meaning ‘fear’. 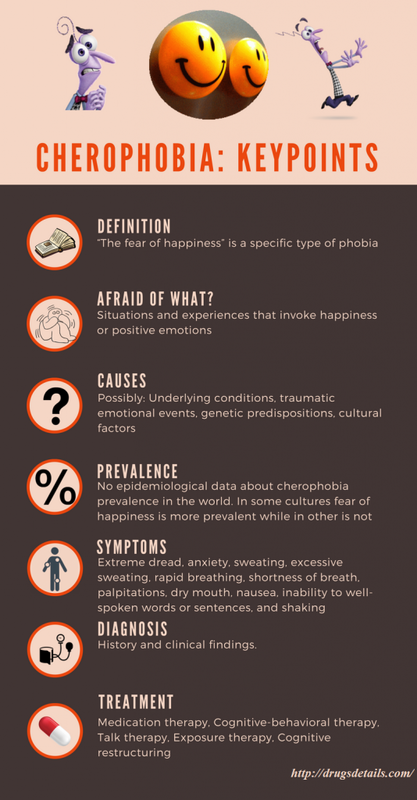 Why are patients with cherophobia fear of happiness? 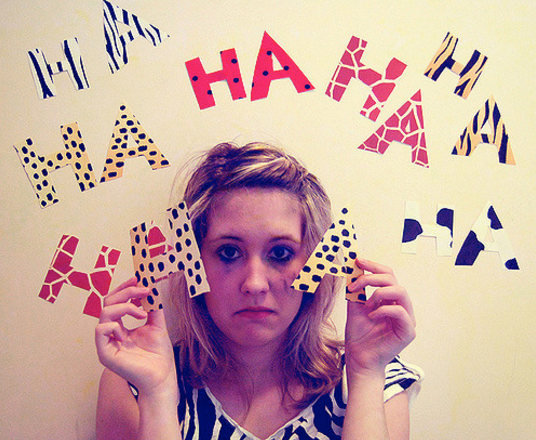 People with cherophobia may fear of happiness and positive emotions for many different reasons. However, according to recent studies, there are two most probable reasons for that and these are: feeling unworthy or believing good fortune will unavoidably leads to a fall. Mohsen Joshanloo from New Zealand developed a so called “Fear of Happiness Scale”, on which participants can mark their level of agreement with statements such as “Having lots of joy and fun may cause bad things to happen.” According to him such beliefs are not typical for every culture and vary from country to country. The study found that the scale is reliable in 14 different cultures. I think I’m afraid of being happy because whenever I get too happy something bad always happens. There are no specific epidemiological data about cherophobia prevalence in the world. In some cultures fear of happiness is more prevalent while in other is not. For example, Japan, India, Pakistan, Hong Kong are scored high on the fear of happiness measurements. In contrast, New Zealanders and Brazilians have the best scores and are considered as most “happy” nations. Underlying conditions, traumatic emotional events and genetic predispositions are probably the most common causes of cherophobia. Fear of happiness can usually be traced back to a particular triggering event in the past and is most commonly caused due to a traumatic event happened at a very young age. Additionally, it is believed that genetics, hereditary factors, and brain chemistry may play an important part in the development of cherophobia. Pursuing happiness is bad for you and others. Some individuals from Eastern and Western cultures avoid happiness because they believe that bad things, such as suffering, unhappiness and death tend to happen to happy people. These findings call into question the concept that happiness is the crucial goal, a belief echoed in any number of articles and self-help publications about whether certain choices are likely to make you happy. Also, in various cultures that believe worldly happiness to be associated with shallowness, sin, and moral decline will actually feel less satisfied when their lives are going well so measures of personal happiness cannot merely be considered a measure for satisfaction with one’s life, and attitudes such as aversion to happiness have important associations for measuring happiness across cultures and ranking nations on happiness scores. Mild-to-moderate fear – when individual will be exposed to happy or delightful situation later on, extreme restlessness and fear may begin to be experienced. Being exposed to the symptoms differs by individual relying upon their level of fear. Moderate-to-extreme fear – when exposed to cheerful circumstance, extreme restlessness or fear emerges. 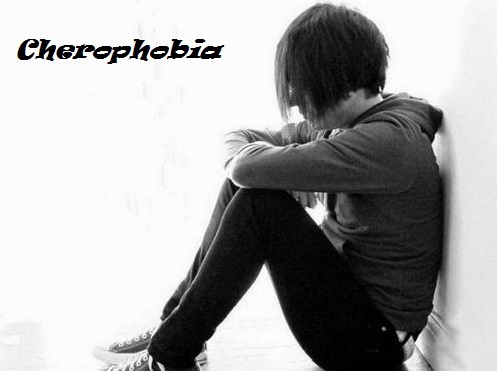 Signs and symptoms of cherophobia or fear of happiness can be emotional, physical, and mental. The nervousness and fear can go from mild sentiments of worry to a full blown panic attack. Cognitive behavioral therapy (CBT) has been shown to be one of the most effective types of psychotherapy for anxiety disorders including phobias. A short-term CBT is focused on teaching specific skills for better anxiety overcoming by directly challenging worries and by returning to the everyday activities step by step that were avoided because of anxiety. So, the final goal of CBT is to help the patient to develop a less offensive understanding of physical changes that may occur when they become anxious. According to some studies it has been shown that CBT is more effective than pharmacological therapy in both the short and long term. The most important advantage CBT compared to medication is that it has been shown to be more efficient several months to years after treatment has finished. Most experts and guidelines recommend combination of medication treatment and CBT. CBT usually need at least 8 to 12 weeks for best results. Some patients may still need more time in order to learn and implement their newly acquired skills. Talk therapy is a type of behavioral therapy. There are different types of this therapy and most psychiatrists are specialized for this method. The talk therapy is predominately focused on dealing with fear. During talking therapy, a trained therapist listen patients and helps him/her to find their own answers to problems, without judging them. The therapist will give you time to talk, shout, cry or just think and will analyze you. It’s an opportunity to look at patients problems in a different way with someone who will respect you and your opinions. Sometimes talking treatments are held in groups or couples, such as relationship counseling. Patients who have cherophobia along with panic attacks may benefit from a prescription drugs in order to prevent panic attacks or reduce frequency and severity of anxiety symptoms, but also to decrease the related anticipatory anxiety. When patients find that their panic attacks are less sever and common, they become able to get into situations that previously have been causing anxiety. Drug choice and appropriate dosage are based on considerations of: safety, efficacy, severity and frequency of symptoms, comorbidities and the personal needs of the patient. TCAs work by increasing the levels of serotonin and norepinephrine in the brain by inhibiting their reuptake, and by inhibiting the actions of another neurotransmitter called acetylcholine. Some TCAs may also affect histamine levels. Affinities for described neurotransmitters vary among different TCAs, explaining why some TCAs drugs are more effective than others for certain conditions or safer. Tricyclic antidepressants are older than SSRIs and are as effective as SSRIs for anxiety disorders. Imipramine is the tricyclic antidepressant that is most commonly used for this condition. Imipramine is usually started with small daily doses that are increased on every few days until the most effective dosage is achieved. Such slow introduction of this drug will help in minimizing side effects such as constipation, dry mouth and blurred vision. Amitriptyline (Elavil) or nortriptyline (Pamelor) is also commonly prescribed. Tricyclic antidepressants should be used in combination with exposure therapy or cognitive behavioral therapy. A combination of antidepressants and cognitive behavioral therapy has been shown to be the most effective treatment for cherophobia. SSRIs works by altering the levels of serotonin in the brain, which like other neurotransmitters, helps brain cells to communicate with one another. Fluoxetine (Prozac), escitalopram (Lexapro), sertraline (Zoloft), paroxetine (Paxil), and citalopram (Celexa) are most commonly prescribed SSRIs for panic disorder, PTSD, OCD and social phobia. SSRIs are also prescribed to treat panic disorders when they are accompanied with OCD, social phobia, or depression. Similarly to TCAs, these drugs are also started with low doses and gradually increased until they reach beneficial effect. SSRIs have better side effects profile than older antidepressants TCAs and MAOI, but they sometimes may produce slight nausea or agitations at the beginning of treatment. These symptoms will fade after some time. Some patients may also experience sexual dysfunction after SSRIs, thus dose adjustment may be necessary or switching to another SSRI should be done. SSRIs should be also used in combination with exposure therapy or cognitive behavioral therapy. A combination of antidepressants such as SSRI and cognitive behavioral therapy has been shown to be the most effective treatment for cherophobia. Beta blockers such as propranolol, metoprolol or atenolol are sometimes prescribed for the performance anxiety relief. These drugs work by blocking the action of adrenaline during anxiety attacks. However, beta blockers are unable to block emotional actions of anxiety, they can control physical symptoms such as: shaking hands, sweating, rapid heartbeat, speaking difficulties. The high-potency fast-acting benzodiazepines drugs including: alprazolam, clonazepam, and lorazepam are commonly prescribed for the effective acute relief of anxiety. They act rapidly, and except the risk of dependency and some side effects, they are well-tolerated by the majority of patients. Common side effects may include: confusion, light-headedness, drowsiness, loss of balance, and memory loss. In the case of cherophobia, treatment with high-potency benzodiazepines is usually maintained for six months to a year. If they are discontinued abruptly patients may experience withdrawal symptoms such as: malaise, weakness, tachycardia and other unpleasant effects. Reducing the dose step by step minimizes these problems. There may also be a recurrence of panic attacks after the medication is withdrawn. MAOIs are a class of antidepressants that have been shown to be effective against panic disorder with or without cherophobia. Phenelzine is the MAOI drug that is most commonly used. Treatment with phenelzine should be started with low daily doses that should be gradually increased until panic attacks fade or the patient reaches a maximum dosage of about 100 mg/day. During MAOI therapy, dietary restrictions should be made especially with food rich in tiramine (aged cheese, red wine, smoked fish, cured meats and some beers) since tiramine may interact with MAOI to causing a sudden, dangerous rise in blood pressure. All patients who are on MAOIs therapy should obtain their healthcare provider guidance about dietary restrictions and should consult with them before using any OTC or prescription medications.